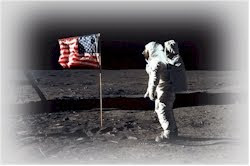 "More than four decades ago America captured the world's imagination by putting a man on the moon, highlighting an era of excellence in space exploration. Unfortunately, with the final landing of the Shuttle Atlantis and no indication of plans for future missions, the Obama administration has set a significantly different milestone by shutting down our nation's legacy of leadership in human spaceflight and exploration, leaving American astronauts with no alternative but to hitchhike into space. The Obama Administration continues to lead federal agencies and programs astray, this time forcing NASA away from its original purpose of space exploration, and ignoring its groundbreaking past and enormous future potential. It is time to restore NASA to its core purpose of manned space exploration, and to define our vision for 21st Century space exploration, not in terms of what we cannot do, but instead in terms of what we will do. In my home state, Houston is home to the Johnson Space Center (JSC), which was established in 1961 as the Manned Spacecraft Center. JSC is home to NASA's astronaut corps, and is the principal training site for space shuttle crews and International Space Station Expedition crews from the U.S. and our space station partner nations. JSC's civil service workforce consisted of about 3,000 employees, the majority of whom are professional engineers and scientists. About 50 companies provided more than 12,000 contract personnel who supported operations at JSC. An estimated 4,000 contract positions will be lost due to the end of the shuttle program. JSC is currently working with its contractors to try to repurpose these positions." Newt is a strong supporter of space exploration, and feels the best way to get there is government incentivized private innovation. He believes that we are falling behind in space exploration and innovation because a bloated bureaucracy is impeding scientific advancements, and the money the government currently spends on feeding this bureaucracy can be better spent working with private innovators. Newt co-founded the Aviation and Space Caucus in 1981, recognizing the need for Congress to renew the focus on space exploration after the early successes of NASA. GINGRICH: "I'm proud of trying to find things that give young people a reason to study science and math and technology and telling them that some day in their lifetime, they could dream of going to the moon, they could dream of going to Mars. I grew up in a generation where the space program was real, where it was important, and where frankly it is tragic that NASA has been so bureaucratized"
Gingrich: "Does it ever occur to you why we spend billions on a space agency that doesn't have a vehicle to get into space?" In response to another question, Gingrich criticized the handling of the nation's space program, saying the country was leading the world, but the program is now stymied by bureaucracy. "Instead of being the exciting, dynamic entrepreneurial future, we studied it to death and we red-taped it to death and we created standards that are absurd," Gingrich said. He said he would like to devote a portion of NASA's budget and use it as tax-free prize money for private companies that develop new ways to explore space. "If you took 5 percent of the NASA budget over the last 10 years, you'd have $8 billion in prizes," Gingrich said. "If you said, for example, we'll pay a billion dollars to the first folks to get to the moon and be able to stay there, we'd have all sorts of folks forming various efforts to get to the moon, none of them would be applying for federal money, none of them would be sitting around waiting for grant reviews."